CAREDIO F., CASTALDINI D. & PUCCINELLI A. In this paper some Deep-seated Gravitational Slope Deformations (Dgsd), identified in the Rio delle Pozze valley near the Abetone Pass, are for the first time described. These deformations are developed in competent rock types (sandstone layers with argillite intercalations belonging to the Macigno Formation) and are characterised by a dominant structural control (NW-SE and SW-NE oriented faults). From the geo-morphological viewpoint they show double ridges, trenches, concavities and reverse slopes. The Dgsd typologies correspond to rock flows (Sackimgen). On the eastern slope of Monte Gomito (located in the adjacent Tor-rente Motte valley) the same geomorphological features shown by the Rio delle Pozze valley Dgsd have been surve)’ed. These landforms, which were analysed with respect to the structural characteristics of the zone, are here considered as the surface expression of an incipient rock slide. 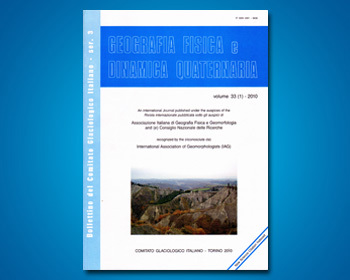 It is therefore an example of «geomorphological convergence* within the framework of slope gravitational processes.